This page was written for two kinds of readers: those who came here from the communications law website via the photo album, and those who arrived via an amateur radio link on the Internet. Let's begin with a short introduction to amateur radio for those who are not familiar with this avocation. Amateur radio is a purely non-commercial form of local or international two-way communications. 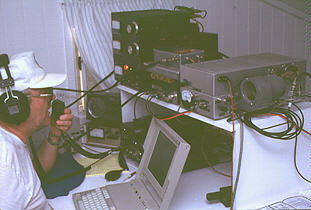 About two million people worldwide are licensed amateur or "ham" radio operators. To obtain an amateur radio license, one must pass a government-approved exam. Each amateur operator has a call sign; mine is N6NB. Some amateurs are perfectly content with nothing more than a handheld radio transceiver for local communications. 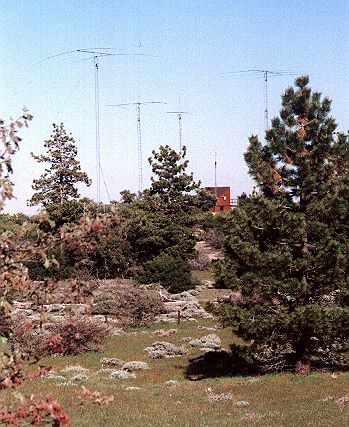 Others are passionate about building elaborate radio stations in outstanding locations such as this mountaintop property in the Tehachapi Mountains 100 miles north of Los Angeles. A station such as this one can provide reliable worldwide communications on a daily basis. My dream of owning a mountaintop radio station began to become a reality in 1993 when I located and bought a suitable 8-acre site. That marked the beginning of a long and difficult do-it-yourself construction project that could never have been completed without the help of several friends. Hundreds of hours of volunteer labor went into this project. For those interested in amateur radio, the antennas in the photo are as follows (from left): a 2-element 40-meter Yagi on a 70-foot tower, a 4-element triband Yagi on a 50-foot tower, a 4-element 15-meter Yagi on a 50-foot tower and a 4-element 20-meter Yagi on a 70-foot tower. Partially obscured is a small tower for VHF/UHF antennas that stood near the main cabin. Although these antennas were not exceptionally high above ground level, the height above average terrain was as much as 5,000 feet in several key directions. The station was capable of transmitter power output approaching the legal limit (1500 watts p.e.p.) on 3.5 - 222 MHz, with lower power on all amateur bands up to 10 GHz. The primary use of the Tehachapi Mountain station was operating in radio contests in which thousands of amateur operators nationwide or worldwide attempt to make as many two-way contacts to as many different geographic areas as possible in a given period of time (e.g., a weekend). Once it became operational late in 1995, this station acquitted itself well, achieving #1 scores nationally or regionally in a number of contests. The most frequent operator of the station was John Desloge, N6MU, shown here at the VHF/UHF console in the loft of the main cabin. 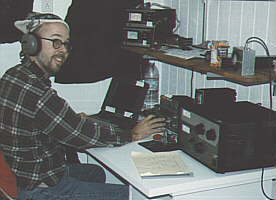 There was another operating console for HF work downstairs; it is shown below with Scott Bovitz, N6MI, at the controls. The two consoles could be on the air simultaneously. For more about our contest results, click here. For more information about amateur radio, a good place to start is the website of the American Radio Relay League, which has materials not only for people who are already radio amateurs but also for anyone who might be interested in obtaining a license and getting on the air. Those already familiar with amateur radio might want to check out the N6NB page, which includes articles about many topics related to this pursuit.